If you love to kayak but don't have space to store one in Manhattan, you can get a quick fix for free on weekends in the summer without ever leaving the city! Paddling around in the designated square at the Manhattan Community Boathouse is almost like playing bumper boats. The sun is beating down on the Hudson River, and while it’s a little crowded, and I only have 30 minutes, it’s free and it’s a chance to get out on a kayak, since having your own in the city is nearly impossible. So little in life is free, and even less is free in Manhattan. So it’s incredibly satisfying on several levels to find out how many free parks and secret spots are hiding in the city, and even more so to find out about a service provided by the city to bring people outside in the best months of the year. If you’ve ever lived in the city, you know that unless you’re in the 1 percent, there’s no way you can keep a kayak in your apartment or in a boathouse near the river. So renting is typically the best—also pricey—option. But if it’s a summer Saturday and all you’re craving is a quick jaunt around the river with your kayak versus a longer tour, if you head down to Pier 26 and the Downtown Boathouse, you can be on the water in minutes. You can also find free kayaking—and two-man kayaks—at Pier 72 and Pier 96 slightly farther uptown, courtesy of the Manhattan Community Boathouse. 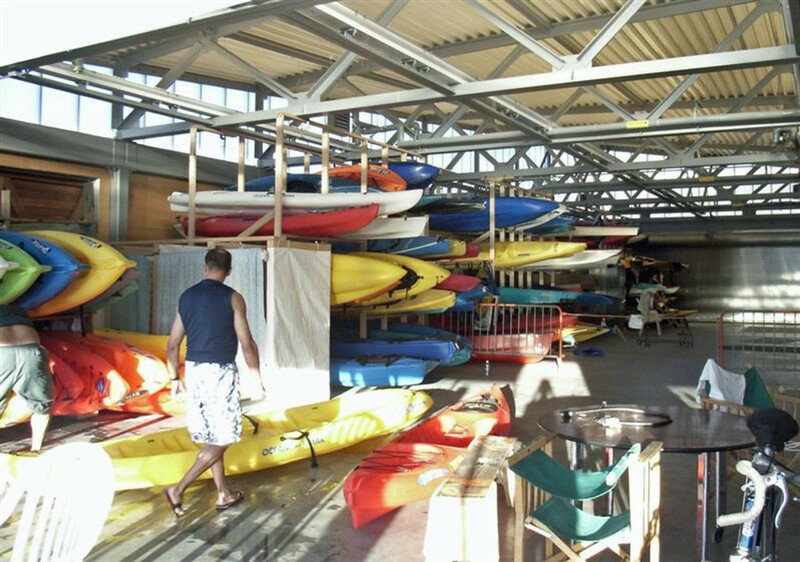 The mission of Downtown Boathouse is “to encourage safe public use of the harbor waters of New York City and thereby provide residents of this space-constrained city with increased recreational opportunities.” Pretty noble, and a huge help to those of us who love any kind of open water activity, but have limited budgets to pursue our hobbies. 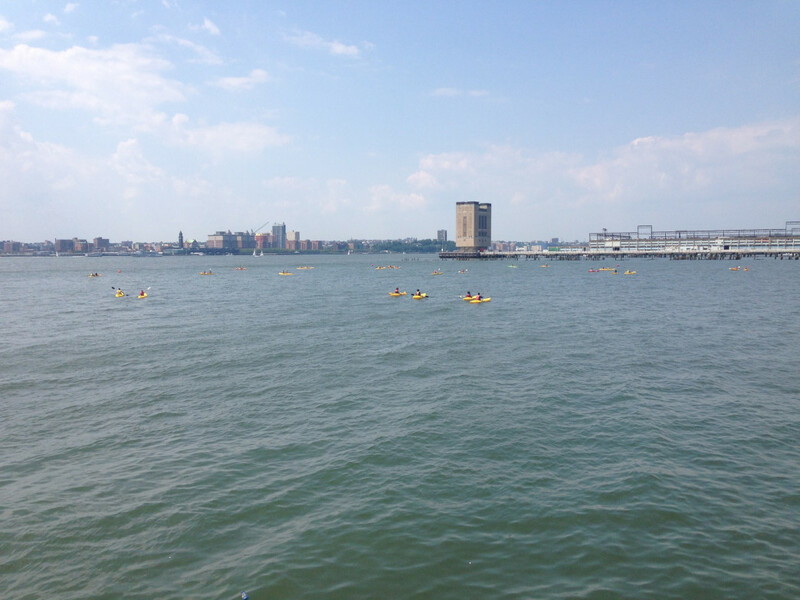 The Hudson is a great place to kayak if you’re just starting out, though avoid falling in! It has a mild current, but between the piers where the kayaks are set up, there’s almost no current and your only obstacles are other kayakers—some of whom are admittedly harder to steer around than any large rock or branch could ever be. The kayaks are all of the open water variety, so expect to get at least slightly wet on your spin around the Hudson. If you’re new to kayaking, this is a great way to test the waters—pun intended—before committing to one of the pricier kayak tours offered by other companies set up along the piers. It’s nothing fancy, but it beats staying on dry land and staring longingly at the water, and an afternoon of free kayaking is never a bad thing. If you’re a pro, this may not be the activity for you, unless you’re absolutely desperate to get out on the water. But for someone vacationing in NYC or here for business, this is a good way to sneak in your normal workout without costing an arm and a leg. All ages are welcome, and the Manhattan Community Boathouse brags that it’s had six month olds to 96 year olds out on the water. There are two locations: Pier 96at 56th Street in Hudson River Park and 72nd Street north of Pier i Cafe in Riverside Park. Note: get there early and be prepared to wait if it is super busy. The last boat of the day launches 15 minutes closing. If you have your own kayak, you can launch from their dock if you have the proper permits.